To be elected the Master of a Lodge is the highest honour the Lodge has in its power to confer on any of its members. 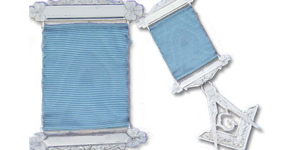 When the Master’s period of office is completed he is presented with a Past Masters’ Jewel by the members of the Lodge, as a mark of esteem of his dedication and service to the Lodge over the past year. 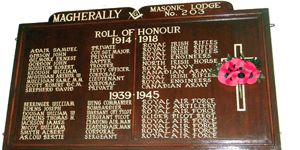 Displayed on a board in the Lodge room are the names, rank and Regiment of those members of Lodge 203 who fought in the two great wars. This board was erected in recognition of the service that they gave. Originally returns from a Lodge were made to Grand Lodge half yearly; this is now done on an annual basis. In the month of October the Lodge elects its officers for the ensuing year and the return is forwarded to Grand Lodge in Dublin for their approval. Failure to make this annual return can result in a fine or suspension of the Warrant. Shown left is the return for Lodge 203 in 1832. The Worshipful Master, Wardens and Brethren of Masonic Lodge No. 203 Magherally thank you for visiting our website. 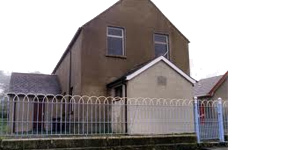 The Lodge meets in Magherally Masonic Hall on the first Friday of each month at 8p.m. excluding July and August. The Annual Installation of Officers is normally held on the first Friday in January. 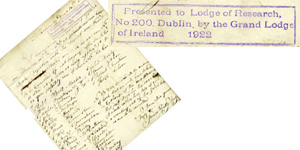 Lodge 203 (originally 801) was founded in 1814 in the townland of Magherally. 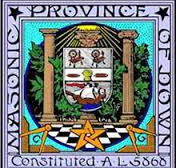 They operate under a Warrant granted by the Grand Lodge of Ireland in the Masonic Province of Down. The Lodge will celebrate its 200th Anniversary in 2014. 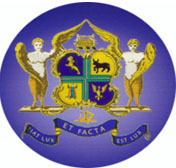 Whether you are a Freemason or not, we hope you will find something of interest as you browse through our pages. We hope you find them informative and give you an insight into our Lodge. We extend a warm welcome at all of our meetings to all Freemasons who are members of any Lodge which is in amity with the Grand Lodge of Ireland.